The truth is out there..... (to borrow a phrase from the X Files) and so it is.... You just have to be in the right place at the right time for all to be revealed. For years, this Corning Ware Versa-Pot pattern has been known as "Burgundy/Cobalt Flower". But let's back up a little bit. Versa-Pots made their debut in 1994 as a Visions product. They were available in both Amber and Cranberry with sizes ranging from 1 liter to 3.5 liters. (though later, a roaster was introduced) When the Visions Versa-Pot sales were still abysmally low, as well as most other Visions pieces, many of the molds were used to press out regular white Corning Ware pieces. 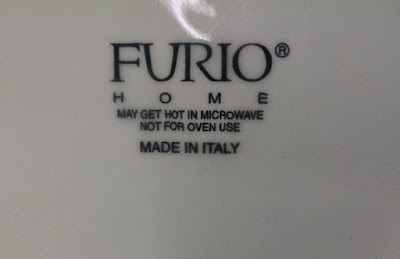 My Risotto Pot (H-12) is a perfect example of this, as it is simply a V-12 pressed out of Corning Ware "Pyroceram" instead of Visions "Calexium"... It even takes a V-12 lid (though a clear one instead of an Amber or Cranberry one). Thus, it is with the Versa-Pots. They were available in white Corning Ware as well. As it turns out, there were some patterns applied to said Versa-Pots as well. Although to date, this appears to be the only one available in the United States (Aside from the solid colors). While cruising through the Good Will a couple days ago, I notices this Pasta Bowl with the same design as the Burgundy/Cobalt Flower pattern on the Versa-Pot. I need another pasta tossing bowl like I need another hole in my head so I didn't purchase it... But I snapped a photo with my phone. 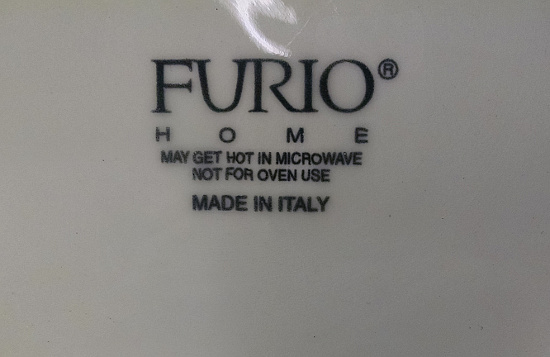 Then, cause I am a clever monkey at times, I snapped a photo of the bottom.... Furio Home! Just like the "Christmas Tree" pattern. Apparently they were in cahoots in the late 90s. This allowed me to look through Replacements, LTD for "Furio" and "La Primula" patterns... As it turns out, this really is a full on Furio pattern known as "Jewflora" (I did not make up the name, it just is what it is) It appears to have been another late 90s pattern, though how long it was available from Corning is unknown at this point. I have a Corning 2.5 1156 like this but it is all green with a clear lid. Great Piece! I have since found one of those green ones (not sure if it is Mint, Celadon or Seafoam) LOL I also found a dusty powder blue one as well. Both have a strange matte finish enamel paint on them. Thank you for solving this mystery for me, as well! The very first piece of Corning Ware pyroceram that I bought was the 1 liter Versa Pot in the Jewflora pattern. It came with a plastic lid. While looking for a fondue pot that wasn't a fondue pot, I came across this in Walmart, I think. However, my mother absconded it from me to make her hot sauce. She cooked the hot sauce in it and set it on the table daily at meals. When it was devoured, she washed it and started over again. I only used it was. I really like the pattern and wondered why I never saw it for sale again. That pasta bowl you photographed is a beaut! I hope I can find one, as well as the test of the pieces in that pattern. Thank you for solving this mystery for me, as well! The very first piece of Corning Ware pyroceram that I bought was the 1 liter Versa Pot in the Jewflora pattern. It came with a plastic lid. While looking for a fondue pot that wasn't a fondue pot, I came across this in Walmart, I think. However, my mother absconded it from me to make her hot sauce. She cooked the hot sauce in it and set it on the table daily at meals. When it was devoured, she washed it and started over again. I only used it once. I really like the pattern and wondered why I never saw it for sale again. That pasta bowl you photographed is a beaut! I hope I can find one, as well as the rest of the pieces in that pattern.